In furtherance of tactical operations to stem activities of criminal elements across States of the Federation, the Department of State Services (DSS) wishes to inform the general public that it has, within the last ten (10) days in the month of March 2018, apprehended the following key members of kidnapping, gunrunning and armed banditry syndicates operating across the States of Plateau, Nasarawa, Taraba and Benue. On 13th March 2018, about 1220 hours, at Wukari town in Wukari LGA, Taraba State, Service tactical team apprehended a notorious gunrunner, Jonah ABBEY aka Jonah IDI alongside his driver, Agyo SAVIOUR aka Dan-Wase. ABBEY has been on the wanted list of the Service for the last ten (10) years over arms and ammunition trade. He has been servicing criminal groups in Bayelsa, Ebonyi, Rivers, Imo, Anambra, Plateau, Nasarawa, and Benue/Taraba axis, including the notorious criminal syndicate led by Terwase AKWAZA aka Ghana in Benue State. Recent intelligence indicated that ABBEY moved arms and ammunition from Konduga in Borno State into Taraba State through his driver, SAVIOUR. It may be noted that subject has entrenched his criminal activities in different parts of the country and as earlier mentioned, has clients especially in Plateau, Ebonyi, Cross River, Enugu and Bayelsa States, among others. Indications are that he sources arms from the Republic of Cameroon and parts of the North-East of Nigeria. A similar operation on 15th March, 2018, about 0500 hours, at Chiwarna Hotel, Angwan Rogo by Bauchi road, Jos North LGA, by the Service tactical team led to the arrest of a high profile kidnap kingpin, Lawal IBRAHIM (a.k.a Alhaji AWALU). Subject was arrested alongside his cohorts namely Ado SALEH and Bayero ADAMU. The syndicate was responsible for the killing of a personnel of the Service in the State, Daanan BALGNAN, on 30th December, 2017 and was involved in other high profile kidnap incidents in Plateau and neighbouring States of Nasarawa, Kaduna and Bauchi. Following the arrest, the sum of One Million, Five Hundred Thousand Naira (N1.5M) was recovered from the suspects. The money is part of the sum of two million Naira (N2M) ransom, which the syndicate collected from Ayuba GAMALE, a staff of Industrial Training Fund (ITF), whose two (2) abducted family members were released on 14th March, 2018. Other members of the syndicate are still being trailed by the Service. The arrest of these suspects is significant for two (2) different but related reasons. In the first case, the arrested kidnap kingpin, IBRAHIM, is adjudged the most dangerous in Plateau State, as he is known to be principally responsible for recent kidnap incidents in the State. This arrest would be a great plus in the fight against these criminal gangs. In the case of Jonah IDI, his arrest would greatly degrade and disrupt the booming illicit arms supply business, which up till now has sustained the crisis in Taraba, Benue, Plateau and Nasarawa States. Earlier, on 7th March, 2018 about 0023 hours, around International market, off George Akume road, Makurdi, Benue State, Service operatives arrested a top commander of the Terwase AKWAZA (aka GHANA) led criminal gang identified as Sesugh AONDOSEER. Suspect is believed to have masterminded several kidnap and robbery operations in Katsina Ala-Ukum and Gboko-Makurdi axis of Benue State as well as Takum in Taraba State. Service intervention efforts is paying off in the South-East. For instance, on 16th March, 2018, about 0630 hours, at Ifite Village, Awka, Anambra State, operatives of the Service arrested two suspected kidnappers namely, Nnaemeka UDOUKWU and Nkem NNONYELU. Both suspects have been on the wanted list of the Service for their involvement in series of kidnap incidents in the State. In particular, UDOUKWU was one of the kidnappers involved in the abduction of one Margret ORJI, mother of an Onitsha-based businessman, Michael ORJI, in January, 2017. 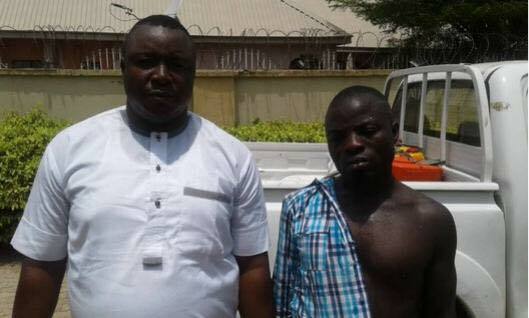 The kidnappers collected a ransom of two million naira (N2m) to release the victim. Both suspects are under Service custody, for further investigation. This Service appreciates the general public for its support and cooperation in providing useful information on criminal elements in their domain. The Service also wishes to reiterate its stance, that no matter how long, every perpetrator of violence and criminality against the Nigerian State and its law-abiding citizens shall be made to face the full course of justice.